Operation on the Lone Wolf and Santa Fe Railroad is informal. There is a car card system and a schedule but there is no time clock. The railroad can be operated by one to four players filling the following positions: Dispatcher, Yard Master, and two engineers. However most of the time it is as the name implies, a one man show. The car card system and the schedule were designed with this in mind. More on those later. I use Two CMI Super Blue walk around controllers for the main line and way freights. These are nice DC powered transformers with walk around throttles. They are equipped with braking and momentum control. They are hooked to the rails using Atlas two cab block selectors. The walk around controllers plug into phone jacks which are located at the ends of each aisle. The yard master has a third stationary throttle which is hooked into the yard blocks via on/off switches. This stationary throttle has a slot car throttle attached so the yard master can walk around the yard area to uncouple and spot the cars, but has to use the reverse switch on the power pack. Since the block selectors are all centralized near the yard, the yard master can also act as the dispatcher when using three operators. All turnouts are hand thrown or electrically switched locally by the engineer. With two operators one person can be the dispatcher/yard master while the other operates the other trains. Or both can operate trains and split up the yard master and dispatcher duties or do both etc. It really doesn't matter because the way the schedule is written, time doesn't matter. Every event happens because the one before it just finished. This works out for the best when operating alone. Some trains can be in suspended animation while others are being ran. I usually operate on my own in whatever spare time I have. I don't have much so I take it when I can get it. The informal method I use allows me to operate for a minute or two, or several hours none stop. All trains are self staging and the session never really ends it just keeps moving on just like life. I can start and stop any time I want and I'm always ready to start where I left off. I also play along with what's happening in the real world. If it's sunny outside, then it's sunny on the layout and everything is running smoothly. If it is raining outside, then its flash floods and mudslides. I will have to clear the tracks. If it's raining here, then it must be snowing in the mountains. I'll have to plow up there too. Other current events are also played out. Earthquakes have caused avalanches which must cleared and damaged bridges or track repaired. Last October when the wildfires burned out of control through our city and we evacuated so did the railroad. Thank God that the fire's in fact the scariest Halloween ever! After it was over I thanked God for every little pig, cow, truck, box car and every other item that goes into bringing life to this railroad. 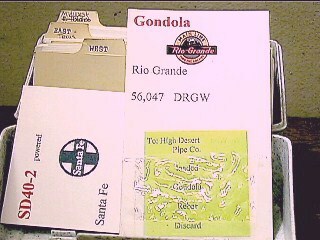 The 3 x 5 inch car cards are printed on a color printer and include the colorful logo of the owner (Santa Fe, etc.) The cards are printed like a deck of cards so that they can be held like a poker hand. This makes them easy to handle and sort through. Also printed on the card is the type of car (box car etc. ), the car's owner, the car's number, it's reporting marks (A.T.S.F. ), and it's destination when empty. Since I operate the Santa Fe these cars are returned to the yard as are private op Union Pacific and Southern Pacific cars are returned to them via the interchange siding. All others are returned to either "East" or "West" and will be transferred back to their home road at some other point on the line which is not in the section modeled. The car cards have pockets made out of cut up strips of zip lock baggies. They are taped onto the cards with clear tape. I make them about half the length of the waybills for easy insertion and removal. The car cards for the cars located in the yard are stored in a plastic card file which has dividers for each destination, east, west, local areas etc. Along the layout there are shelves in the benchwork which hold the cards for the local industries and for trains which are waiting on sidings. The waybills are color coated for each day. Yellow for Monday, blue for Tuesday etc. This way I can have variety instead of reliving the same day over and over again. This is great for those special deliveries using that uncommon car or special flatbed load that isn't seen every day. 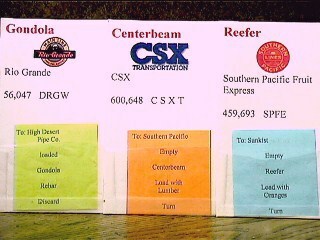 The waybills are kept in a small box which is separated into sections for each type of car, boxcar etc. When a car needs a new assignment it gets the top waybill from the proper section. It can only take a waybill if it is the correct color for that day. On Monday you can only use a yellow waybill. If the top waybill is blue then all of Monday's demand has been met and the car will remain empty and either be returned home empty or left in the yard for another day. In creating the waybills I had to figure out how many were needed for each day. First I figured out which businesses receive empty cars and load them to be shipped off the layout. That was fairly easy because you can look right at the business and say that, High Desert Plastics has an output of two boxcars a day, seven days a week. While Sports Co, the clothing manufacturer has an output of one car every other day, Monday through Friday. Next I figured out which businesses received loaded cars from off the layout. These cars will have to be routed off the layout first as empties so they can return with the proper load. A good example of this is centerbeam flat cars which arrive loaded with lumber from the pacific northwest. They are delivered to the local lumber yard. When the empties are picked up and returned to the yard they must be returned to their owner. Since there is no loads headed back that direction the centerbeam flat cars are returned empty with a waybill that sends the empty car off the layout to be loaded and when loaded, to be delivered to the local lumber yard. Important both for cars which you actually have to load as well as for cars such as refers which require special handling. Make sure you have the right type car for the load. The town and the business. Any locations not modeled are either East or West depending on which direction it leaves the layout to get to it's final destination. West bound cars go to Los Angeles, Long Beach, San Diego and containers go on to Asia. East bound cars go toward Chicago with a cut off to Texas. The passage to the north is first to the east and then cuts off at the Barstow Fork, so northbound traffic also goes east. The small town of Lone Wolf is located on Wolf Mountain in the Southern California division. To the west of Wolf Mountain is San Bernardino and beyond the layout is Riverside, Orange, Los Angeles, San Diego counties. The orange groves of Redlands and Highland are modeled as a branch of the North End. The Hemet Valley is a large agricultural area as is most this western region. Los Angeles has several large industries and also consumes mass quantities of everything. Long Beach and San Diego both have large sea ports and a large percentage of Asian imports enter the country here in the form of containers full of electronics or automobiles which must be loaded onto enclosed auto carriers. To the east is the High Desert. A branch heads off through the Lucern Valley toward Cushionbury and the mineral rich mines of the Mojave Desert. At Barstow the road forks and heads north to northern California, Oregon, Washington and Canada. The other fork heads east toward Chicago and the Midwest or Texas and the gulf of Mexico. The Union Pacific crosses the mainline in Colton where the railroads interchange freight. Just north of San Bernardino the Union Pacific's route joins the mainline and shares the track through the pass. North bound UP trains cut off in the high desert and head to the town Mojave. East bound UP trains travel on past Barstow and cut off at Dagget. The empty information is on one side and the loaded info is on the back. After the car has been loaded the waybill is turned over. When the car is unloaded the waybill is removed and placed back in the waybill box. The Monday Morning Local has just returned to the yard. While on it's route it picked up an empty centerbeam flatcar. The car card says that when empty to return the car to the east. It just so happens that there is a need (waybill) for that type of car (centerbeam) in the east. So the yard switcher puts the car onto the eastbound train that it is assembling on track 3 in the yard. The train goes the the east. This may take a lap or two but eventually it will stop at the High Desert Staging yard. When it does all of the waybills are either turned or discarded. Cars with prop loads are now loaded or unloaded as directed. When the train resumes, it will be a new train. The new train leaves the staging yard and goes to it's destination, the main switching yard. From the main yard the car will be delivered to the lumber yard. With the order delivered the waybill is removed. Repeat the whole process. Tuesday's waybill for local Sunkist packing plant. Everyday (in season) there are two of these orders which must be filled. Luckily there are several empty refers in the yard. They go out with the morning local. The local drops them off in the orange groves and picks up the two left there yesterday. Turn the way bill and place it in the car card holder located in the benchwork. Tomorrow's local will pick up the cars and they will be routed to a market in the east. I use a schedule that says which trains are to run in what order but there is no time schedule or time clock and the session can begin and end at any time and at any point in the schedule and be picked up whenever the next time I get to it. Not having any experience in creating prototypical time tables I just started running a couple of trains and let the card system create the demand for the trains. Before you know it the schedule wrote itself. I just made notes of the trains and which blocks they used and this became the schedule. After picking up local cars and returning them to the yard it became apparent that outbound trains were needed in several directions. Some with higher demand than others. As soon as a full length train could be assembled to go one direction it was out of the yard and on it's way. The train would go the appropriate direction and travel over the length of the layout. Soon that train would run through the �twilight zone� tunnel and emerge as another train bringing cars to town from �beyond the layout�. While in the staging yard before the tunnel I switch the way bills in the car card pockets or turn them over as required. Soon the car waybills were creating demand for trains of every direction and final destination. More trains were added until the demand was met. When all of the trains had been run a new day begins. And the schedule repeats it's self only this time all the cars are at different locations and must complete their journey. Before you know it the whole system takes on a life of it's own and creates it's own traffic flow patterns. The schedule is frequently revised to create better flow and less bottle necks. It's a fun, easy to use system the never has to be reset and never repeats it's self as it is always moving forward. The changing days make it have a new pattern everyday. To create your own schedule start at the very beginning with no rolling stock or locomotives on the rails, and say this is the first day of this railroad and the first thing I need to do is send out empty cars to the local factories along the line. Take a waybill from the folder for the first factory which needs an empty. Put the waybill in the car card for a car from your home road. Do the same for every industry on your layout. Place the actual cars on the tracks in the yard and have a switcher assemble them in order of the deliveries. So there, the 1st train on the schedule is ready to roll. If you have more than one town you my need more than one local. Place the locomotives required for the train on the proper track and get them hooked up to the train and let it roll. If you have two or more locals going out to serve different towns, send the furthest out first so the closer one doesn't hold it up. Next find waybills for the industries which will receive freight from off the layout. Put these waybills into cars from foreign roads. Place these cars in your staging yards so that they come onto your layout from the proper direction. This is the next train on the schedule, the through freight coming into town. If you have one from each direction start them both off and eventually they will make it to the yard after having passing meets with the locals. After the local sets out it's cars it returns to the yard with any that it picked up. These cars get sorted and are the basis for the next trains on the schedule. When the through freights get to the yard they are broken up and the power waits for its next assignment, which will be anything in the yard heading out of town if there is enough cars to make up a train. Etc. etc. etc.... Learn to adjust your schedule based on the supply and demand for cars based on your industries. The idea is to have as few cars in the yard as possible. They should be out on the rails making money not sitting around.